With more than 2,000 miles of streams in the Great Smoky Mountains, the area is home to one of the most diverse fish populations in North America. Most streams are at capacity, so this is the perfect place to cast a line, and leave your troubles behind. To get started, we’ve answered 5 common questions about state regulations, seasonal fishing and more. 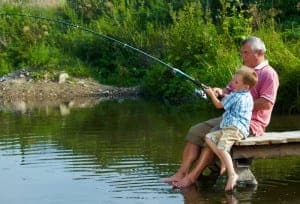 Fishing is permitted all year long in open waters around the Smoky Mountains, and each season of fishing is different. Inside the National Park, fishing is allowed from April 1 – November 20. Catch and release season runs December 1 – March 31. Inside the city of Gatlinburg, streams are closed on Thursdays for stocking. During summer, the best time to fish is from sunup to mid-morning. During the hottest points of the day, the fish move to deeper water to escape the excessive heat. The fish begin biting again from early evening until sundown because they leave the deeper water once the sun isn’t as bright. To catch the most fish during the fall season, wait until afternoon or early evening. Since fish are eating extra to prepare for winter, they bite more during the warmer parts of these cooler days. Fish aren’t biting in the early mornings because it is still too cold. In early afternoon, you’re guaranteed to get at least a bite because the water is warm and their metabolism is cranked up from a long winter. Where are some great places to fish in the National Park? The city of Gatlinburg is the only city in the state that stocks the rivers with trout each week. Thousands of fish are stocked in Gatlinburg streams annually, so inside Gatlinburg is a great place to toss out a line. When fishing in the streams in the National Park, you only have to remember a few water current tips to find out where the fish are biting. Rocks and Boulder Pockets – When water hits stones, it splits around the rock, creating an area of calm that fish often like to rest in. Inlets – As fast moving water flows down a river into an inlet, it slows down, creating a whirlpool perfect for fish to settle into. Merging Currents – When two bodies of water meet, fish find twice as much food, so there twice as likely to be biting. Outer Bends – When the stream bends, the faster water carries the food to the outside, and the fish follow. There are even children’s streams, where the entire family can safely enjoy outdoor fun. Two streams for children only are North Gatlinburg Park at the city’s entrance and Mynatt Park off Historic Nature Trail. What are the Smoky Mountain fishing regulations? To fish in the Great Smoky Mountains, you must meet a few regulations before and during your fishing trip. Only artificial flies and lures on a single hook can be used in the National Park. Inside the National Park, fishermen cannot use bait because anything non-native can threaten the native fish species. Bait fishing is strictly prohibited to keep the ecosystem healthy and clean. Anglers also can’t use a treble hook because most fish caught with treble hooks don’t meet the park’s size limits. Once anglers reaches the daily catching limit, they must stop fishing. For more information about water safety while fishing, click the link below. What are Tennessee’s fishing license requirements? Anyone 13 years and older must have a valid fishing license. If you fish outside of the park in Gatlinburg, you must also have a city license. To trout fish in Gatlinburg, residents and non-residents must purchase special additional licenses. To purchase a fishing license, you can visit any of the locations listed below. Aunt Bug’s Cabin Rentals offers a variety of Gatlinburg river cabins with the soothing sounds of running water and unlimited fishing opportunities. The spacious relaxing cabins are an oasis from the everyday and are the perfect place to rest after a long day of casting lines. Give us a call today at (800) 953-5655 to speak to a reservationist, and begin planning your next Smoky Mountain adventure.